Conventional glycolic acid products can be drying and irritating. 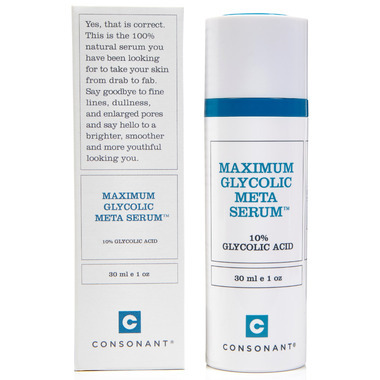 Consonant Maximum Glycolic Meta Serum (TM) is formulated to be at the juncture of hydration and functional exfoliation. The maximum allowable concentration of glycolic acid dissolves the bonds that hold dead skin cells to the skin to allow healthy, radiant skin to show through. A custom blend of four unique botanical extracts soothe skin to minimize irritation, and help protect against dryness. The result is a clinically proven, high-performance serum. Your skin will feel smoother, softer and will look more even. Directions: PM: Cleanse skin with Consonant Natural Foaming Face Wash. Dry skin and apply 1-2 pumps of the Maximum Glycolic Meta Serum to face, neck, and décolletage, avoiding the eye area. Some tingling is normal. Allow to dry, and follow with HydrExtreme® and the Consonant face cream of your choice. Ingredients: Water, Glycolic Acid, Lactic Acid, Propanediol, Glycerin, Citric Acid, Malic Acid, Salicylic Acid, Phragmites Communis Extract, Centella Asiatica Extract, Hibiscus Sabdariffa Flower Extract, Poria Cocos Extract, Sodium Lactate, Hydroxyethylcellulose, Niacinamide, Sodium PCA, Glycine, Gructose, Benzyl Alcohol, Benzoic Acid, Dehydroacetic Acid. If you have very sensitive skin, start by applying Consonant Meta Serum every other night for one week, and then nightly until the bottle is finished. Rest skin for four weeks, and then begin again. Always protect skin from sun exposure when using a glycolic product. It is recommended to use Consonant The Perfect Sunscreen or the HydrGasm Kit each morning. Noticed a difference in smoother texture quickly. Would be five stars if not for the pump mechanism, which leaked a little in its packaging. Otherwise, I will purchase again! This serum is A-MA-ZING! I have fair/very sensitive skin and have trouble finding products that are gentle yet effective. I have noticed a huge difference in be texture of my skin, less breakouts/redness and smaller pores. Iâ€™m on my 3rd bottle, canâ€™t get enough! This product does seriously leave your skin feeling like silk. Softness i have not felt in years. I apply at night and when i wake up i feel like i don't need to do anything to my face - just feels amazing. No stinging at all even though it's 10% glycolic acid. Love it.